Join us for CyberMaryland 2019, Maryland’s 8th annual gathering of the country's premier cyber community! CyberMaryland has been the epicenter of information security & innovation since its launch in 2011. It's a timely and informative 2-day conference where Maryland’s leading IT firms, top universities and tech-savvy workers join forces with the federal government and the US military to network and experience unparalleled information sharing. Maryland is home to an increasingly influential cyber community, including a high density of cyber engineers coming from the nation’s top security agencies. That makes this event a not-to-be-missed opportunity for both national and Maryland-based industry partners. CyberMaryland has consistently attracted top leaders, experts, and key decision makers through its unrivaled content. So conference exhibitors can showcase and demo their latest cybersecurity innovations and services to the best and brightest the cybersecurity industry has to offer. The conference was attended by more than 1,000 of the nation’s top cyber leaders and professionals, including federal, state and local government agencies; academic institutions; cybersecurity entrepreneurs; and industry leaders of research and development. Attendees represented more than 50 government agencies, 250 cyber companies, colleges and universities, and international partners such as Australia and Canada. View 2018's list of sponsors and exhibitors. The CyberMaryland Committee hopes you will participate this year as an industry exhibitor or sponsor. Local Maryland businesses, as well as national ones, are welcome. Sign up today! All relevant technologies pertaining to cybersecurity are welcome. If you are interested in purchasing a Premium Booth Space (marked as red spaces on the floor plan), you must purchase a Gold or Platinum Sponsorship. 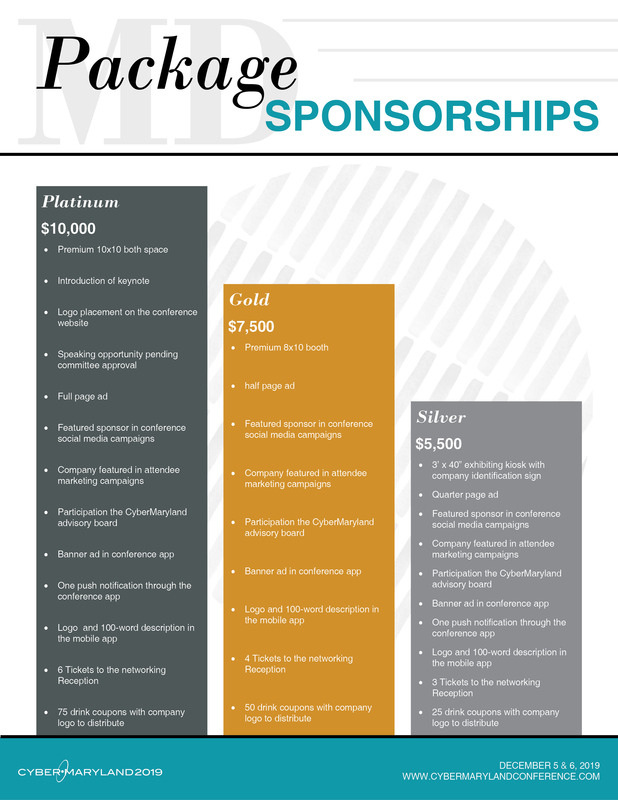 Premium spaces are not available without purchase of a Gold or Platinum Sponsorship. Each 3’ x 40” Kiosk Marketing Service Package includes 2 company reps to the Exhibit Hall and all the Conference Sessions. You can purchase additional representative below. To be listed in the 2019 CyberMaryland Conference Exhibit Guide and in the mobile app, FBC must receive your exhibit listing and logo no later than November 21, 2019. 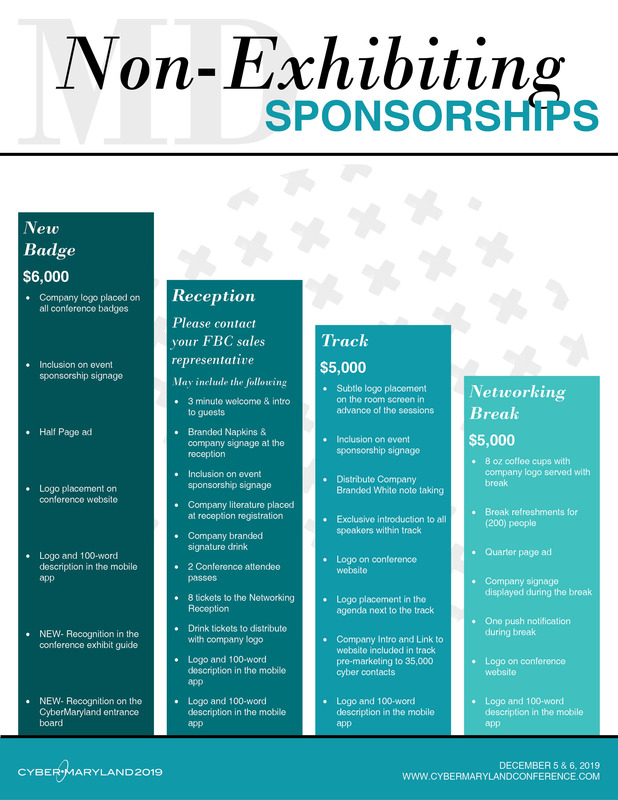 Certain sponsorships have different logo deadlines; please speak with your FBC Account Manager if you have any questions about your logo and description deadline. 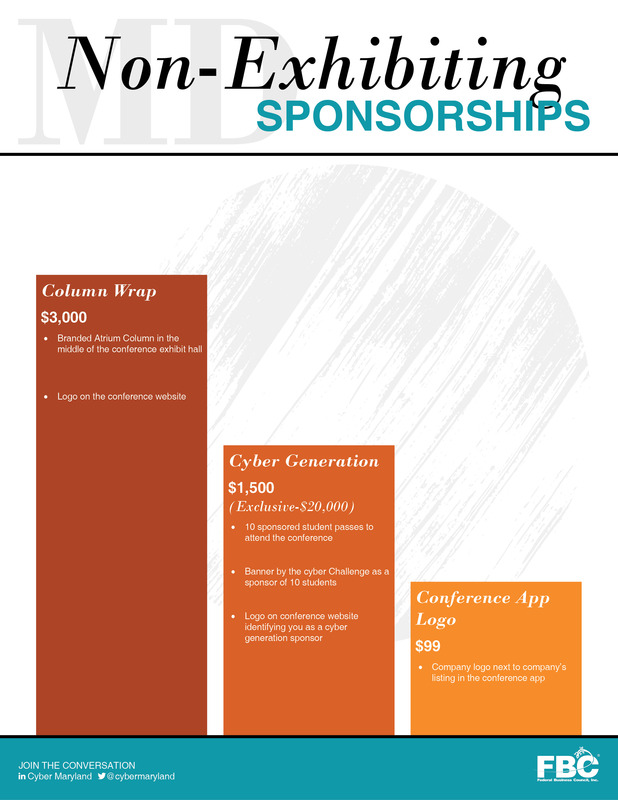 Sponsorships The 2019 CyberMaryland Conference is a great event opportunity that brings together important members of the government with industry/academic organizations from all over the US. 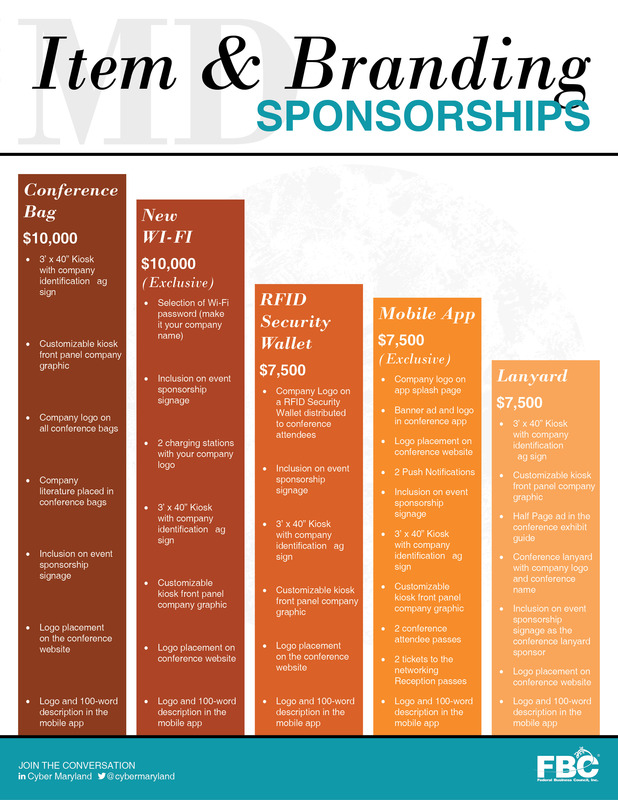 Sponsors will have the opportunity to increase brand awareness, as well as increase opportunities toward acquiring new customers. Contact your FBC account manager today to learn about the new opportunities. Click on an image below to enlarge it! Vendors will be able to access the pre-conference area for set up the day prior to the event- December 4th from 6:00 PM - 8:00 PM. Vendors can arrive as early as 6:30 AM for set-up on Thursday, December 5th. The conference registration starts promptly at 7:30 AM. All setup must be completed prior to that time. Please be respectful/aware of noise levels, including any automated video or audio. All vendors will be in the atrium that is open to all. Exhibit Staff Badge Information Please complete an FBC Badge Form by the due date given below. BADGE DUE DATE: Monday, December 2, 2019 by 12:00 p.m. EST Purchase Additional Exhibit Staff Exhibiting companies may bring 2 on-site representative(s) to staff their exhibit booth. There is a $300.00 per rep fee for additional company reps for this event. To register additional reps you may use the online registration form or you may download a manual registration form and fax it in. The Hyatt Regency Baltimore Inner Harbor is located in the heart of Baltimore City. It is located 11 miles from the Baltimore-Washington International Thurgood Marshall Airport (BWI), 106 miles from Philadelphia, and 38 miles from Washington D.C.
Transportation to and from the Hyatt Regency Baltimore Inner Harbor is provided by the Metro SubwayLink, Light RailLink, Commuter Bus, and MARC Train. There are two options for shipping your materials to the hotel. You can either use the decorator (must fill out exhibitor kit) or go through the hotel. Below is how to ship directly to the hotel. The Hotel does not accept any liability for equipment, goods, displays, or other materials that arrive unmarked or fail to arrive at the Hotel. The Group is responsible for insuring its property for loss or damage. Please notify the Hotel in advance of shipments in excess of 200 lbs. The charge for guests shipping from the Hotel without their own account is the standard shipping rate, depending upon shipper, plus handling charges. Handling charges are subject to change without notice. Due to limited storage space, additional storage charges will be applied to packages stored more than three business days. The best address for google maps to get to the Hyatt parking garage is 300 light street, Baltimore, MD 21202 – when you pull into the front you can either valet or pull right into the connected garage and grab the ticket from the machine. For the discounted parking ($15 per day) you will need to get a ticket from conference registration before you leave. When you leave the garage you need to put the ticket into the machine that you received when you entered the garage then the ticket we give you which will automatically bring the price down to $15. Please bring a handcart to transport your equipment from the parking lot. Pull up banners are allowed, but you will need to speak with your account manager with regards to large backdrops, as space is limited. Contact If you have questions about the logistics of this event ON THE DAY OF THE EVENT please contact the event manager Eric Longo at (800)878-2940 ext. 227 or email eric@fbcdb.com. Prior to the day of the event please direct any questions to your FBC Account representative.